Hanna Boys Center provides at-risk teens with the education, therapeutics and care that heals the effects of childhood trauma, allowing them to mature into fully-functioning, responsible adults. Through a residential program as well as community-based collaborations, Hanna helps motivated teens make the difficult changes necessary to get their lives back on track. Hanna’s program is the heart and strength of who we are and why we’re here. It’s guided by our core values: nurturing the mind, the body and the spirit; transforming our boys from the trauma they have faced into productive, healthy, compassionate young men. 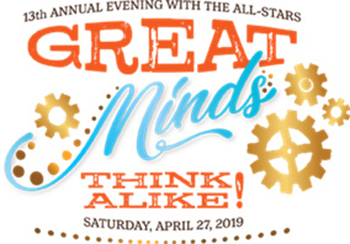 Great Minds Think Alike – the 13th Annual Evening with the ALL STARS is coming up on April 27th. Check out this short video to see how Great Minds Think Alike. Enjoy and we hope to see you there!